La vivacité, la brillante et la douceur du toucher de Ghindin expriment cette jeunesse. (...) accompagnement presque affectueux d'Ashkenazy (...). A stellar recording in every respect. (...) Highly recommended. Alexander Ghindin's virtues - his velvet-toned cluency, his rhythmic flexibility, his Romantic harmonic sensibility and (most of all) his patient willingness to soak in the details of even the most redundant detours (...). Vladimir Ashkenazy and his orchestra provide sympathetic support and Elgar Niels's notes give ample background. Warmly recommended. 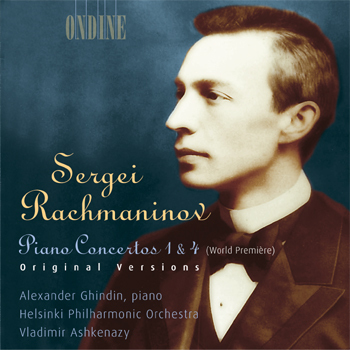 Produced in close collaboration with The Rachmaninoff Society and its founding president Vladimir Ashkenazy, this CD couples the original versions of Sergei Rachmaninov's First and Fourth Piano Concertos. The acclaimed young Russian pianist Alexander Ghindin is accompanied by the Helsinki Philharmonic Orchestra under Vladimir Ashkenazy. This disc features the first-ever recording of the Fourth Concerto's 1926 version, which has now been published by Boosey & Hawkes. The story of how this version has been revived starts, when the manuscript was handed to Alexander Rachmaninov, the composer's grandson, by the Library of Congress in Washington, D.C. Vladimir Ashkenazy subsequently informed Ondine and proposed a recording of the work, which eventually took place in Helsinki in March 2001. The Rachmaninoff Society contributed with liner notes by Elger Niels and rare photographs from its archives. To view Vladimir Ashkenazy's thoughts on Rachmaninov as a composer, click here.